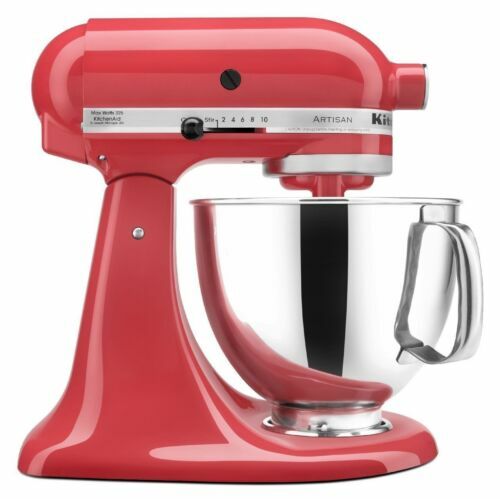 Currently on eBay.com you can grab 5 QT KitchenAid Stand Mixer for ONLY $179.99 FREE shipping. Lot of colors to choose from! They are refurbished and from a top rated seller. The KitchenAid KSM150 Series Tilt-back Head Stand Mixer is incredibly versatile and more than a mixer. With all the available attachments (sold separately), you can use it to make homemade pasta, stuff fresh sausage, whip up ice cream, and give fruit a squeeze. This model has a 325-watt motor, 5 quart stainless steel bowl with comfort handle, and a tilt-back mixer head design that provides easy access to bowl and beaters. No wonder generations of cooks have cherished theirs. Isn't it your turn? * Please note: Refurbished items come in a generic shipping box bearing the KitchenAid Label. They are Packaged directly from KitchenAid.